'The Parliament should be able to reflect the land it represents. 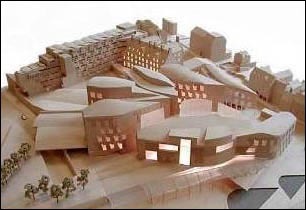 The building should arise from the sloping base of Arthur's Seat and arrive into the city almost surging out of the rock"
'The Scottish Parliament has a building that meets the vision I believe Donald Dewar and his colleagues set for it. 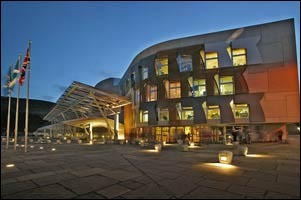 I express the hope shared by many that the excellence of the parliamentary activity within the building will reflect the quality of the structure, and that the painful lessons of it's procurement are not lost on those privileged to serve there as representatives of the Scottish People"
The Scottish Parliament Building is situated at the foot of the Canongate (formerly the site of Scottish & Newcastle brewery) opposite Holyrood Palace. The chosen design featured the forms of upturned boats, in his design for the roof. Historic Scotland ensured that listed building Queensberry House was retained as part of the development. Enric Miralles died in July 2000 just a few months after the project began. Donald Dewar then also died in October the same year. Which threw the project into a series of debates, delays and spiralling costs. The final costs far exceed the initial estimates by more than 10 times to a staggering £431 million. An inquiry was set up by Lord Fraser to investigate. 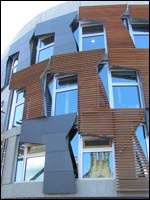 The building was completed and opened by the Queen on 9th October 2004, three years longer than planned.